Lazuli Bunting, a new bird for me. 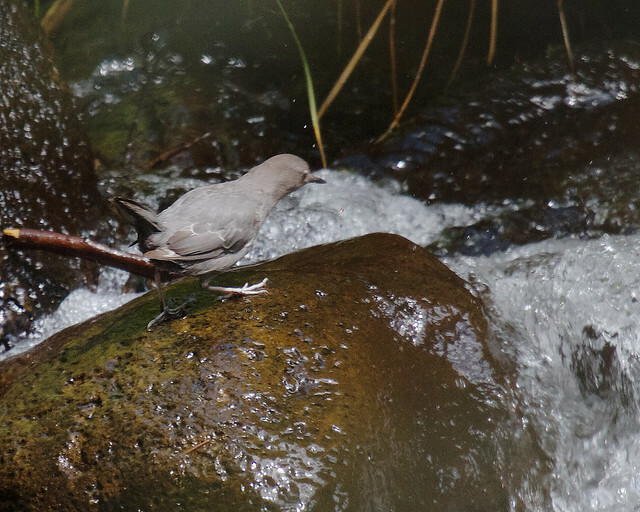 American Dipper, the first one I have seen in about 10 years. Two of my photos were selected for an exhibit at the Museum of Monterey from November 15 to December 31, 2014. 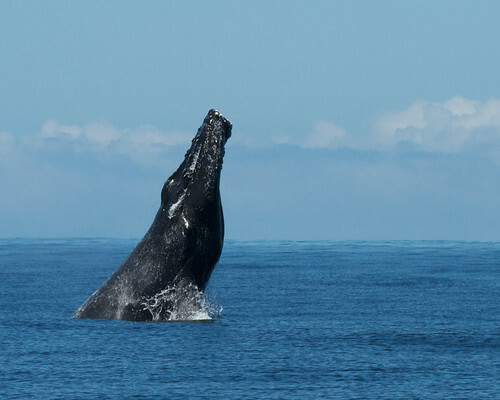 The photos will be raffled off on January 25, 2015 during WhaleFest 2015, with the proceeds benefiting both the Museum and WhaleFest. 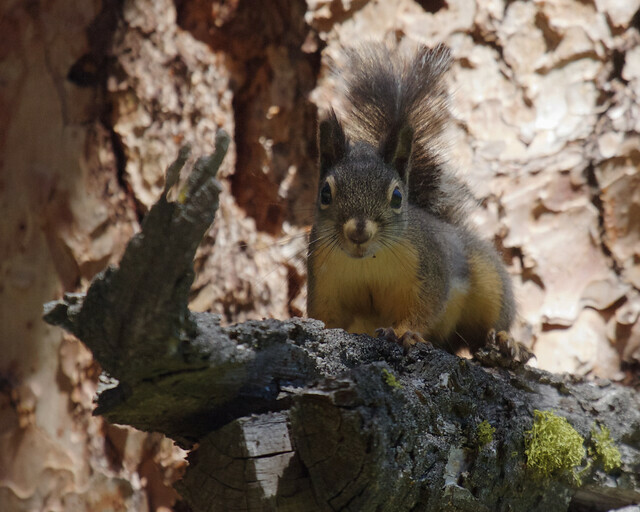 The two photos are a couple of my recent favorites. The first is a harbor sea and pup in a distinctly “hallmark” moment. The second photo is from last year when some anchovies got trapped at Monastery Beach. Gulls, cormorants and pelicans descended in droves. The shot has 4 pelicans at various stages of their dives. So if your in the area in from Thanksgiving through December, check out the WhaleFest exhibit. So far 2014 has been a good year for me in birding and shooting birds at Point Lobos. I have spotted four new species for me and been able to photo a number of rare visitors. You can see some of these on the birds page. The primary reason for this success is persistence. There is a strong correlation to the number of bird species I spot in the Reserve to the number of hours I spend in the Reserve, go figure. 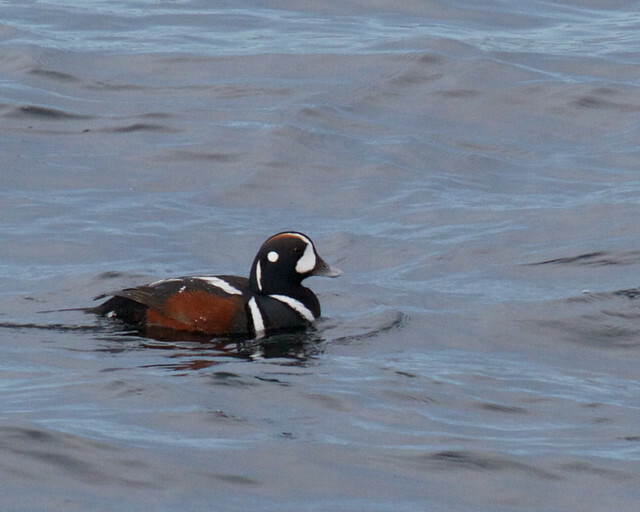 The good fortunes started in February when I arrived at the Reserve early and spotted two male Harlequin Ducks at Weston Beach. I had seen a female Harlequin in the past, but the males were definitely a treat. 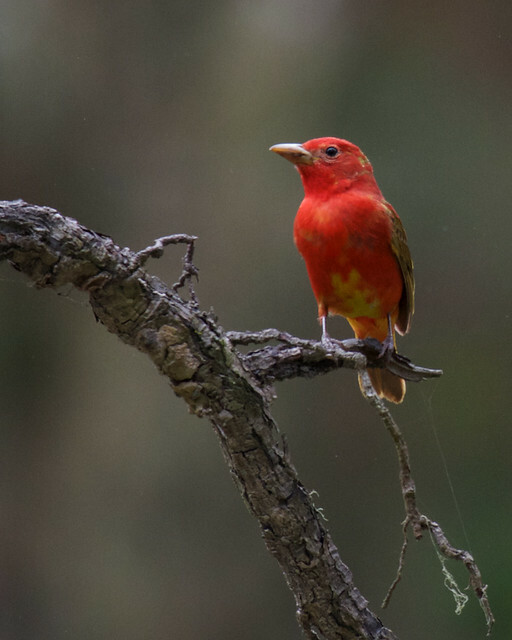 And then the other day, I spotted a young male Summer Tanager, a new bird for me. Of course I didn’t have my camera with me and attempts to shoot it with my iPhone were less than successful (15 shots and only 1 with the bird in it). So I hoofed it back to the truck, then returned hoping that the bird hadn’t moved on. The bird was still there, but stayed down in the brush. Finally after about 20 minutes of walking back and forth to spot it, it flew up on to a branch in plain view. Persistence is a good thing. As always these are in no particular order and my top ten goes to eleven. 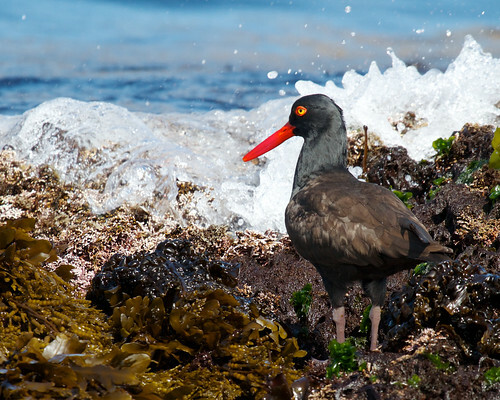 I should probably do a full post on oystercatchers, they have provided wonderful shots over the years. I think that this one is going to slip in as number 11. I’m not entirely wild about the shot, but it is my best shot of wild Orca. 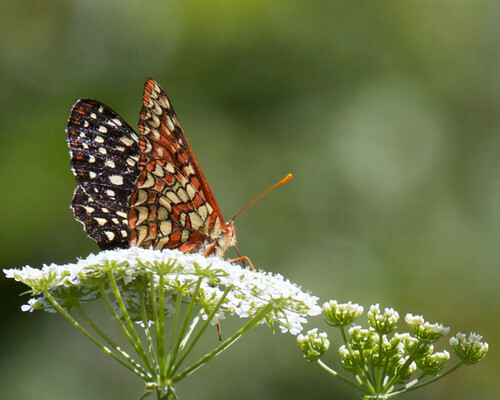 Continuing my tradition of getting nice shots containing invasive plants, a Checkerspot butterfly on Poison hemlock. 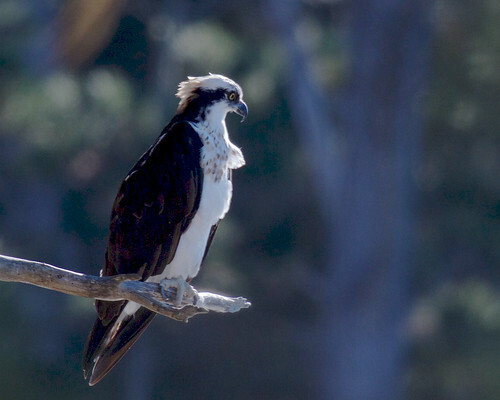 The Osprey recently returned to the Reserve. You kind of had to figure that this one might show up. 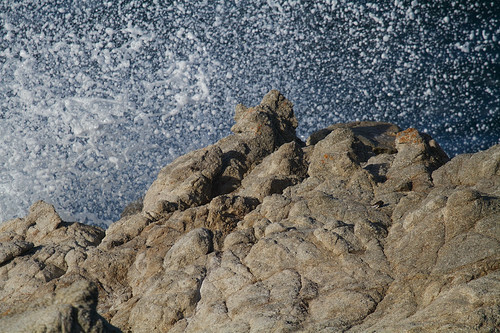 Waves exploding on rocks, I can never get too much of that. 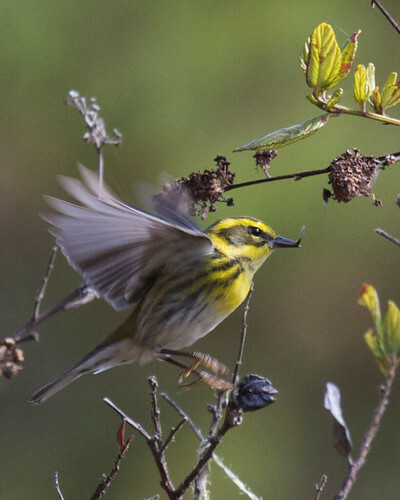 A Townsend’s Warbler in flight with a termite. Just a few Brown Pelicans feeding at Monastery Beach. 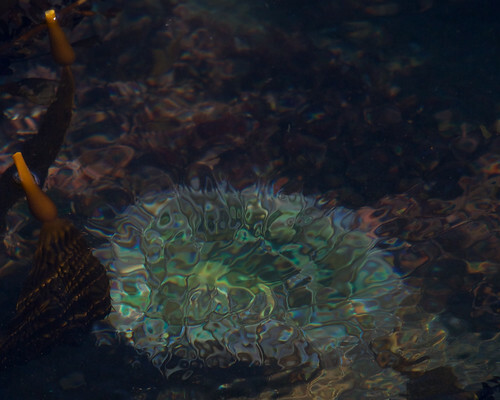 Anthopleura elegantissima in Whalers Cove. When an owl calls out to you, you have to stop and find him. Waves on Gibson Beach, taking advantage of smoke from the Big Sur Blaze. Sometimes you nail the image and sometimes you are so far off that you have to give up. Then there are those in between times where you screwed up the shot, but it is close enough that you can hammer it back into something acceptable. 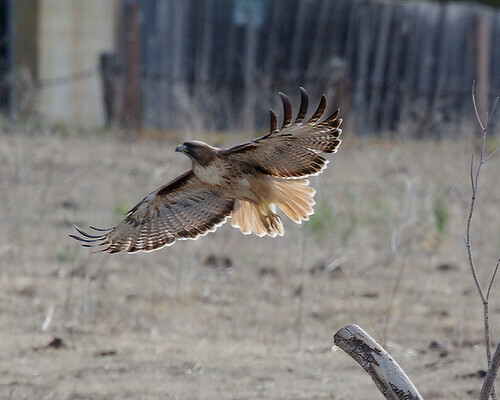 This shot of the hawk lies in that group. It had a bad motion blur, but hitting it hard with FocusMagic got it to where it is an acceptable web image. I don’t think I will try printing it. 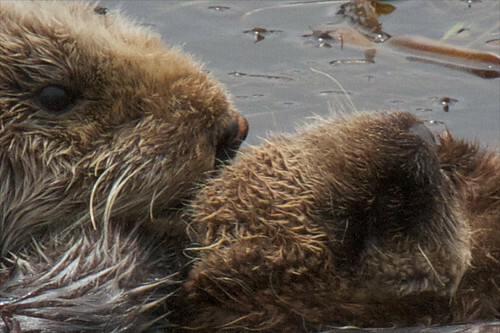 How close can you get to a Sea Otter? Real close, but shot with a 400mm lens from over 100 ft. This is a question that Docents at Point Lobos deal with all the time. We have to evaluate the situation and make suggestions as best we can. As near as I can tell the Marine Mammals Act says that you can’t intentionally disturb a marine mammal, but does not give specifics on distances or activities. 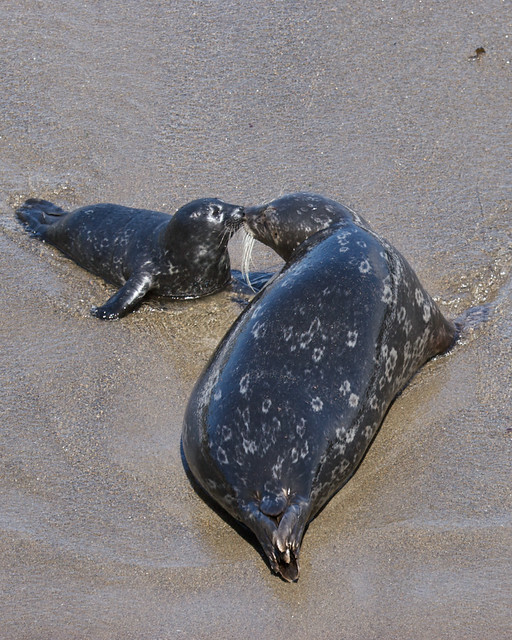 We have guidelines that say you can’t be within 50 ft of one or 150 ft of a mother and pup. I haven’t found the origins of these guidelines, but they seem reasonable. And yet, you can be 30 ft away and not disturbing the otter at all or be 200 ft away and talking in a loud voice that obviously disturbs them. For me if I am taking a shot and the otter looks at me, I am too close. It is time to back away quietly. 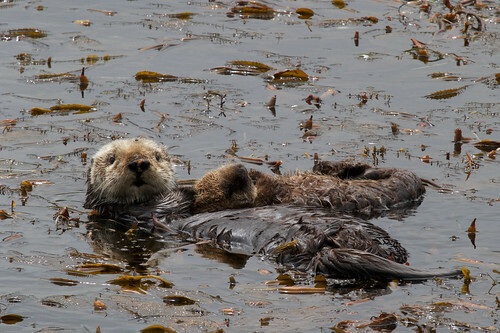 If the otter responds to your shutter, you are too close, back away. I recently got shots of two “new” birds. I say that because I have probably seen them before, but just never taken the the time to ID them. There are lots of little grayish-brown birds that reside in this group. 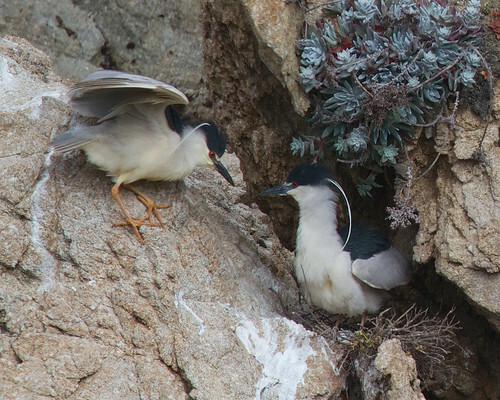 But as I try to learn more of the birds around Point Lobos, I find that I need to spend some extra time to get these IDs. 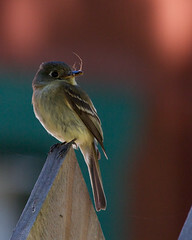 So I present the Pacific-slope Flycatcher, a bird that I list as heard more than seen. And true to that listing, I hear them all the time in the Reserve, but have only seen them twice. 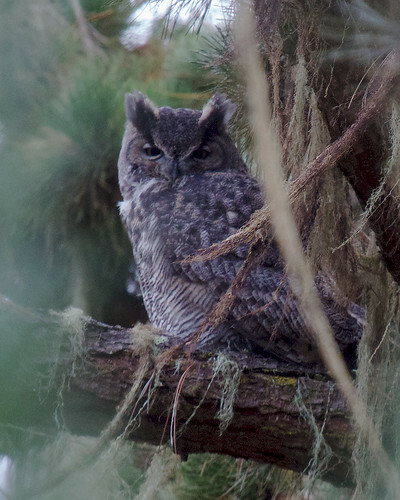 Fortunately a pair has been nesting near the Reserve entrance and allowed me to get this shot. The second bird was a bit harder to ID because it was flitting about in the top of a big sycamore tree. 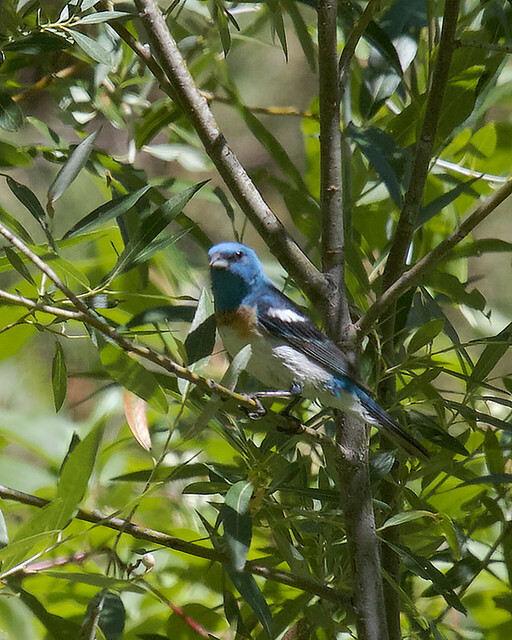 It was showing obvious flycatcher behavior, so managed to stay at the limits of my auto-focus and move every time the focus got close. I took over 50 shots and and spent 20 minutes on this one bird. And after all of that, I still didn’t have a no-doubt-about-it shot. 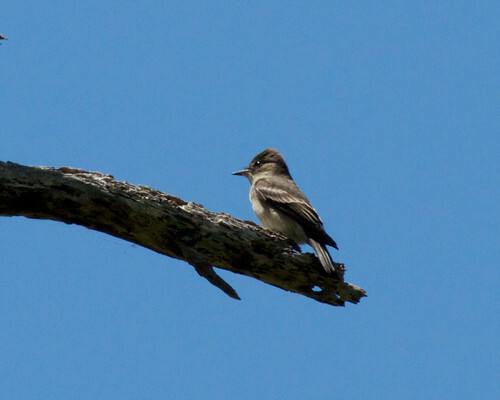 So I went through all of my shots, what I could remember of the call, the likely suspects and came up with a Western Wood-Pewee. One of my photos was used in a Flickr blog post and another was picked up by Yahoo. 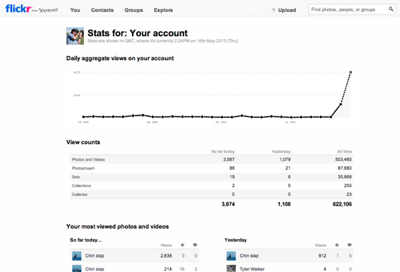 Now I have over 5000 views today. This is up a little from my usual 100+ views a day. Not that I am going to complain, but it is a little silly. 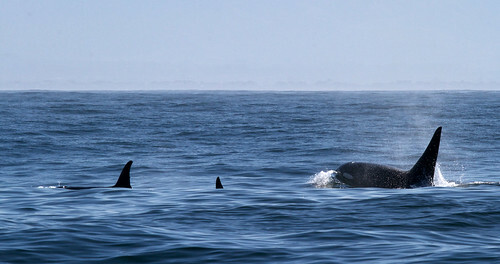 The photos were from my whale watching trip on Monterey Bay last summer. 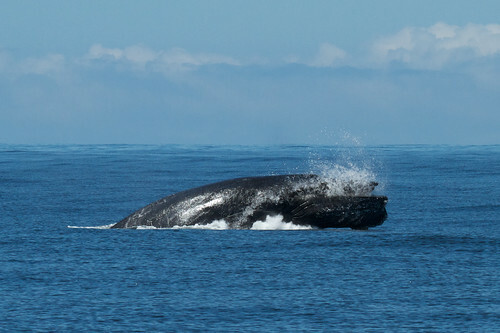 I took a series of shots of a Humpback Whale doing a chin slap. You may recognize one of the images, it was in my best of 2012 collection. The other is at the tail end of the chin slap. Certainly whales coming out of the water generates a bit of excitement. The thing that amazes me is that this whale wants to make a big splash! That is why it is doing it. But look at it as it comes out of the water. 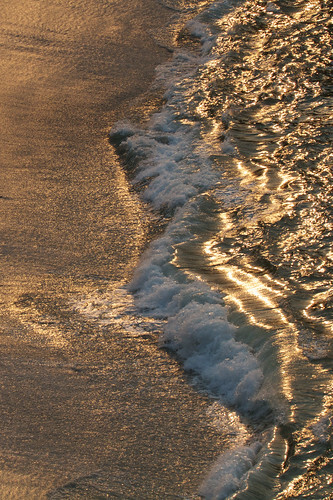 There is hardly a ripple. Olympic divers who try to enter the water without a splash, could learn a few things from this critter. Thanks to all of the Flickr and Yahoo folks. I truly appreciate you checking out my photos. Hi, my name is Tom and I am a birder. 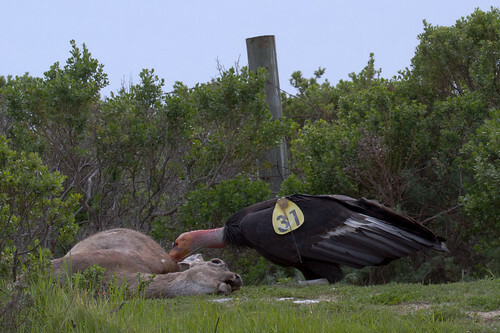 I am not the crazy, over-the-top birder that you might have seen in movies or on TV. But when there is an opportunity to see a bird that I haven’t seen or photographed before, I get a little bit itchy. When the report came in a week ago that a Lawrence’s Goldfinch was spotted in the Reserve, I thought “Great, that is wonderful that you saw this bird, my chance of seeing it is nil”. Before that moment I had never heard of a Lawrence’s Goldfinch. I knew the American and Lesser Goldfinch and had seen both in the Reserve, but this was a new one for me. I figured it was a migrant and would be on its way shortly, and far too shortly for me drag the camera out. Then came a second report and a third. Now the itch is strong, time to scratch. I go out to see what I can see. House finches and American Goldfinches, no Lawrence’s. Just what I suspected, it was here and moved on. 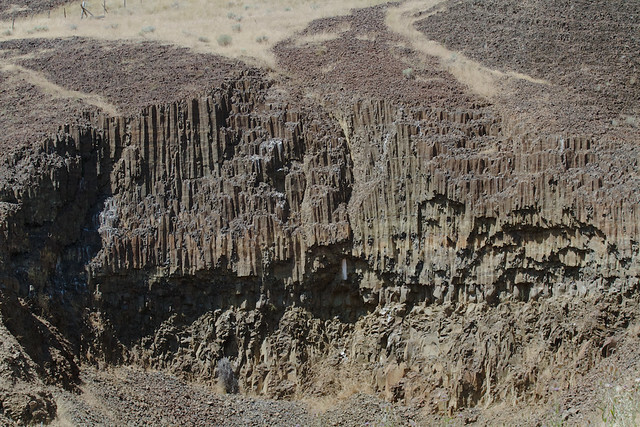 Then a fourth report, with photos. Ok, It is a mission now and I will both spot the bird and get a photo. Friday morning, I went out to Granite Point and circled the point three times. The first circle spotted and confirmed the goldfinch was there, The second circle grabbed a shot, the third circle nailed the shot. 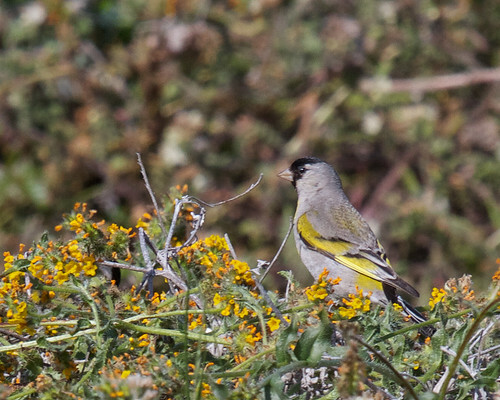 So now I have a new bird on my life list and a new photo in my Monterey Birds set.